I am an Independent Consultant for Scentsy. I've been apart of the Scentsy family since 2012 and I have loved every minute of it. Not only does Scentsy feed my addiction to smelly good things but it also allows me to work from home and make my own schedule; which if you are like me and don't like being forced to be somewhere for a specific amount of time, It's perfect. It also helps me make an income while I'm going to school. For those of you who love yourself candles and making your house smell good, Scentsy is for you. I, myself, was an avid candle lover for many years - That was until I was introduced to Scentsy - and even though I still do have some candles around my house, they aren't usually lit. More for decor now. 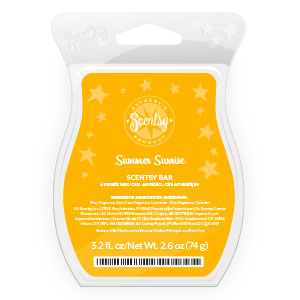 Scentsy is a flameless, sootless, smokeless, wickless candle. We have a wide selection of ceramic warmers to choose from as well as scents that fit your smelling fancy. The ceramic warmer is ran by a light bulb, think of it as a mini lamp (or a nightlight...which we have available). In the "bowl" part of the warmer you place a cube or two of your favorite scent's cube bar and let the warmer warm your fragrance up and spread the scent flowing into your house...just like a candle would. (View picture above). I cannot tell you how much I love Scentsy and the wide variety of products we have that I fall in love with every day. I host house parties, online parties, basket parties, etc. and I absolutely love it. 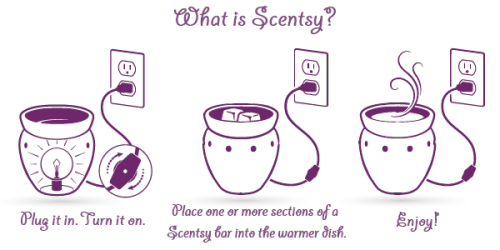 The only way for you find out how much you love Scentsy is to try it out yourself, Click the link for: MY WEBSITE. 1. I get to play with a product I love. I seriously love being able to go into my office and play with all of my scentsy products. I can stay in my office as long as I'd like or I don't have to go in there at all and not get in trouble for not "doing my job". But you can definitely find me in my office 4-5 times a day for a long period of time. 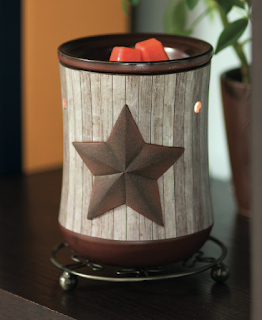 Our products are awesome - especially those scentsy buddies. 2. I get to stay in my Pajamas. Oh I forgot to do laundry? Oh Well...my flannel PJS and this tank top work just fine. Don't forget about my bare feet. Not having a dress code slays me. really. 3. I make my own schedule: I hate office jobs. Or really any job that tells me I have to be at a specific place for a specific amount of time, which is usually 8 hours. With Scentsy, I make my own schedule by booking parties when it's a good day for myself and my hosts/party goers. 4. I don't have a timed lunch break. I am feeling like Chipotle today, but oops, the line is really long. Oh Well, Guess my lunch will just be stretched out to 2 hours instead of a quick 30 minutes. I mean really. I love being able to sit on my couch and relax for as long as I want. Shoot, I may not even sit at my desk today. 5. Productivity. Ok lets be honest, I feel like I can get WAY more done with my time and work. If I am sitting in an office or am surrounded by co-workers I have way more distractions and I'm the kind of person who gets distracted way to easily. *Excuse me for a moment while I go make an iced coffee, oh look the june issue of victorias secret* Where was I?? Oh yes, Productivity. When I am able to turn on so music, drink my tea, and sit in my house alone...I get WAY more done. I make sells. I book parties. I dance around the room with my Nile the Crocodile that smells like Apple Pie. 6. Money. My Husband is laughing at me right now saying "Money? What Money Babe?" but really, I am spending, I meaning We, are really spending much less that I could be. I work from home, which means I don't need money for gas every 3 days because I have no commute. I have food here so I don't need to go to taco bell every day. (I'm jealous of those who get to) and I get to save money on buying professional work clothes. Which is a win, because I'd much rather be sitting in my PJ pants and sports bra anyways. 7. Space & Creativity. Although I do know some work places allow you to decorate your office or cubicle with some personal pictures and fun stuff. But sadly, most don't, and you have to keep it pretty professional looking. I am one of those people that have to have a space that I love being in. I have to have things on my desk or around my desk that make me happy. Like the Mason jar full of red roses my husband picked from our rose bushes, or the wine bottle that's next to it that I could very well drink as I'm writing this without being drunk in an office and getting fired and I have a scentsy warmer (which you could too) and I have pictures of people I love. and many other things that make my work space extra special to me. Being in a work space I love and I can be creative in is my absolutely favorite thing. 8. I get to be a stay at home Fur mom. Our little devil dog is 11 weeks old and he is in total human "terrible twos" stage, which means we can't leave him home alone. Especially because he is still working on this whole crate training and potty training thing. And I love being able to stay home and take care of him. and I mean, when we have actual Human Children it will still apply to all above. ....And there you have it - I love being an Independent Scenty Consultant and I Love being able to work for myself and work from Home. You know that you can join in the love and become a Scentsy Consultant too? For $99. and you get a bunch of really cool things like your kit. and $300 worth of other cool stuff for joining in June. It's a win win if you ask me. Seriously, ask me how to Join.